It’s difficult to write a profile when there is absolutely no information available on the subject. Thus begins my nearly aborted profile of the prolific Clarence Budington Kelland. Why Kelland? Well, he feels like an old friend to some degree. You see almost every time that I pull out a magazine from the 1920’s, 30’s or 40’s to list for sale and take a peek at the contents page more often than not I will run across the now common four words by Clarence Budington Kelland. I see it most often in issues of the Saturday Evening Post, more often than not as one of a couple of serialized stories in an issue of that publication, though if he’s not listed under the serial heading he very likely has a standalone short story somewhere in that issue anyway. When I decided to take on the June 1928 issue of The American Magazine in an issue of my newsletter, Random Issues, I was pleased to see an article by Clarence Budington Kelland included and even better it was accompanied by a photograph which is at the top right corner of this page (and that’s the stem of a pipe in his mouth, not a cigar!). I then decided to make him the second magazine writer that I’d profile on this site. The decision seemed to be a poor one as I bounced from wall to wall scanning the indexes of various research books that I have on hand — nothing. I brightened some when I Googled “Clarence Budington Kelland” and found over 20,000 matches, but then I nearly abandoned ship when I scanned the first 20 pages of listings and discovered that they were more or less useless. Update: January 2009 – A Kelland collector who I’ve been in contact with several times the past couple of years has finally created a site dedicated solely to Clarence Budington Kelland. So for more information be sure to take a look at Michael Judd’s Kelland site. So just as I had decided to move onto an easier subject such as Zane Grey, I decided to check my own magazine sales listings, just to see what I had available featuring Clarence Budington Kelland and if maybe any of those titles included a biographical sketch. Bingo! Once again, The American Magazine, this time the October 1931 issue that I happened to have in stock, included an article by Kelland titled “Hitting Fifty” which was referring to his most recent birthday. Now Clarence Budington Kelland did not die until 1964 and this article was written 33 years earlier, but at least it’s something. I was also a little concerned about the article having been written by Kelland himself, and while there is the possibility of embellishment on his part most of the key dates and places he named did check out with the other limited sources I ran into on the web. Best of all there was another photo of Kelland, which is also included at the very bottom of this page. First impression after reading both of The American articles, I like this guy. Or at least I like who he is when he’s writing. 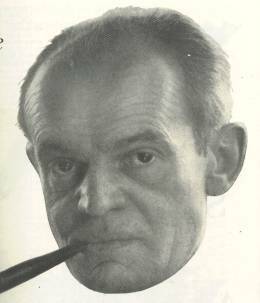 I did neglect to mention the various articles I came across in TIME Magazine’s digital archive, but most of them dealt with Clarence Budington Kelland post-1931, or post-age 50, and made mention mostly of his run as the Republican National Committeeman from Arizona in the 1930’s. The reason I bring this up was that TIME obviously wasn’t a big fan of Kelland’s, and the same man whose articles I found charming and well-thought is referred to variously as “pugnacious,” “vitriolic,”, “peppery,” and “gaunt-faced” by TIME, a publication known for its own style of writing which would often portray public figures that they viewed as bad guys with similar descriptive terms. Gaunt-faced is actually kind of funny, as I recall seeing it used somewhere else as another example of TIME’s disgust with someone else. 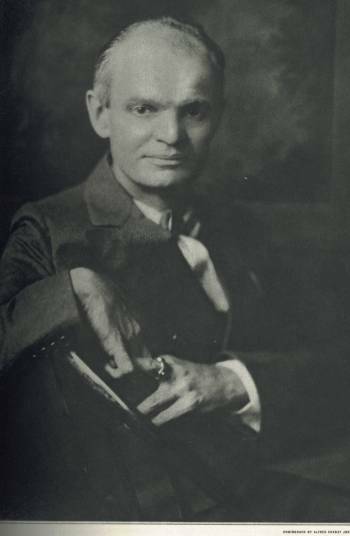 In the “Hitting Fifty” article, Kelland gives us his basic biography in confirming that he was born in Portland, MI in 1881, a time and place about which he writes, “I was born when people had time, and when five miles was distance, and when the Civil War was a very living memory” (34). When he was ten years old his family moved to Detroit where his father ran a grocery store. Kelland claims to have dropped out of school in the 10th grade to go to work in a chair factory. That occupation was not a happy one for Clarence Budington Kelland and so after reading “The Honorable Peter Stirling” young Kelland decided that he wanted to be a lawyer. He then attended night school for three years, did quite well by his recollection, graduated and became a lawyer (though he was pretty vague about that part). I gather he wasn’t a very successful lawyer, as Kelland next decided to do something he had loved doing for a number of years: “All my life I had been writing things for fun. I even wrote epic poems, and so, when it became necessary to eat, I turned naturally to the newspaper business-and my real education started. I believe three or four years in a good newspaper shop to be the most profound and practical education a man can have” (132). After working at this nameless newspaper, Kelland was hired as a proof-reader at The American Boy, a job he says that he was so ill-suited for that they quickly named him editor instead. About his early days writing, Kelland wrote, “If it hadn’t been fun I would never have stuck to it for the seven years it took me to sell my first story for seven dollars” (132). Kelland would then marry, and soon after move to Vermont because “My wife’s father was dubious about sons-in-law who thought literature was a profession, so he induced me to give up editing to go to Vermont and help run a clothespin mill” (132). But he also writes that this is when good luck really started coming to him as he created his Scattergood Baines character, who debuted in a 1914 issue of The American Magazine and about whom Kelland was still writing stories at the time of this article’s publication. I’m a little cloudy about this part, but Clarence Budington Kelland would next move to New York and then from there France during the first World War, where he served as the publicity director of the Y.M.C.A. The way I read this Kelland valued his time in Europe during the war and returned to New York afterwards, where he would continue to write stories and novels. Kelland was very optimistic throughout the “Hitting Fifty” article whenever referring to his age. On his earliest days he wrote, “As I look back, I find that it took my first thirty years to get moderately educated and prepared to settle down to the business of living and to undertake the job I was to live with and by. I don’t mean educated to do that job, but to start trying to do it. After that it took another ten years to get a foothold in this so-called profession of writing” (34) and about hitting fifty he wrote, “There is nothing about being fifty that I don’t like-nothing. I even think I am much handsomer” (132). How could you not like this guy? I guess if you’re Henry R. Luce, that’s how. In closing his article, Clarence Budington Kelland wrote something that I found a little sad after having discovered the way Harlan Ellison was using him as prime example of the forgotten writer. Kelland wrote “When I am very old, people will begin to believe I was a greater man than I was, and that will tickle my vanity. There will even be people who will feel it a little distinction to be around with me, because a sort of tradition will have built itself around me, and legends and so on. None of which, probably, will be true, but they will be there and I shall benefit from them” (134). Earlier, while reviewing Arizona in the August 21, 1939 issue of TIME, they referred to that story using the second of Kelland’s two standard plots: Stories using plot number 1 were “streamlined, wisecracking romances, in which a duffer outwises the wiseguys” while those using number 2, or Arizona plotline, were “yarns, mostly historical–in which all stops are pulled out to paean the American Way.” Finally, in the February 28, 1964 issue which included TIME’s obituary for Clarence Budington Kelland, they referred to him as the “tireless practitioner of the first basic plot (good guy wins).” Well, contrary to TIME’s view of Clarence Budington Kelland, just let me say that Saturday Evening Post found itself in millions of reader’s hands once per week throughout the 1920’s and 30’s and more weeks than not they had something new to read from Clarence Budington Kelland. Kelland died at age 82. Died: CLARENCE BUDINGTON KELLAND, 82, author of popular fiction who billed himself as “the best second-rate writer in America” during a phenomenally prolific and profitable career; in Scotsdale, Ariz., Feb. 18. Ex-Detroit lawyer Bud Kelland pecked out more than 10 million words, sold more than $1 million worth of serials and other pieces to The Saturday Evening Post alone, made household characters of Scattergood Baines and Mr. Deeds, and still found ample time to dabble in politics, preceding Barry Goldwater as Arizona’s voice of right-wing Republicanism.